A plane crashes in an isolated area in New Guinea. Robert Harper, played by Massimo Faschi, is separated from his acquaintance Rolf and finds himself alone, lost and stranded in the jungle. 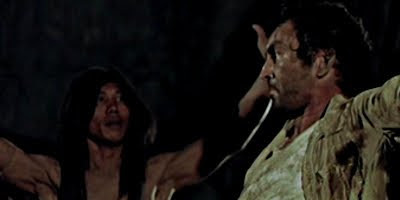 Captured by a native civilisation of cannibals, tortured, humiliated and even treated as a bird, Robert plans his escape with the help of a sympathetic native woman played by genre favourite Me Me Lai. This is Deodato's prequel to his masterpiece Cannibal Holocaust and though not as violent, gory or as raw edged, Jungle Holocaust still certainly delivers and holds its own very well within the Italian cannibal genre and is one of the best entries with great acting, a believable plot, apparently based on true events, great jungle adventure sequences with its fair share of nasty situations and cannibal violence including a couple of very strong scenes. Animal lovers be warned as the film does show a few scenes of violence towards animals. Jungle Holocaust is a roller coaster ride of cannibal jungle adventure and mayhem and is not to be missed by fans of this genre.